Now that the weather is getting nice it is time to think about your summer garden. 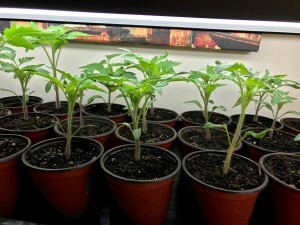 I have several varieties of organically grown tomato seedlings for sale. Some of the varieties include Black Krim, Cherokee Purple, Gold Medal and White Cherry. They are $3 per plant in 4″ pot or 4 for $10. Email me pam@shantifarm.org if you are interested. There will be more seedlings (peppers, eggplant, beans, cucumbers, basil) coming soon!